Metal Slug 2 is a run and gun video game developed by SNK. 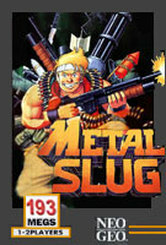 It was originally released in 1998 for the Neo-Geo MVS arcade platform as the sequel to the popular 1996 game Metal Slug. It was re-released in 1999 in a slightly modified/remixed form as Metal Slug X.
Gameplay in Metal Slug 2 is very similar to the previous game; the player(s) must shoot constantly at a continual stream of enemies in order to reach the end of each level. At this point, the player confronts a boss, who is usually considerably larger and tougher than regular enemies. On the way through each level, the player can find numerous weapon upgrades and "Metal Slug" tanks. The tank is known as the SV-001 ("SV" stands for Super Vehicle), which not only increases the player's offense, but considerably adds to their defense. Metal Slug 2 added several new weapons to the player's arsenal. A single shot from the Laser is capable of killing a column of infantry, and sustained fire can quickly destroy vehicles. Fire Bombs found in the second level can help to clear away mummies. Armor Piercing Shells give the Metal Slug tank cannon shells that only fire straight, but which do tremendous damage. The "Camel Slug" is a Vulcan cannon mounted on a camel. The rider is elevated and still vulnerable to enemy fire, but has improved movement. To help fight a boss that crawls up a tower, the "Slugnoid" armored frame is capable of leaping great heights. Its cannon is pointed downward, to assail the enemy attacking from below. Twin Vulcan cannons provide firepower, but they are stripped each time the Slugnoid is hit. The "Slug Flyer" is a VTOL jet fighter which can fire powerful air-to-air missiles. It also has a Vulcan Cannon, which is designed to fire upon forward targets. Another player can "wing-walk", or ride on top of the plane.